This place was haunting me from a long time. Twice had failed to make it to this place. This time, luckily, was serendipitous as there were no dropouts – Thanks to the enthu gang, good weather- Thank God, bookings done in time – Thanks KD and flooding the mail servers and inboxes with hundreds of mails(Spam?) – Thanks ME! I had tough time porting 8 sleeping bags and 2 tents plus my backpack from my office to the Majestic bus terminal. Thanks Srushti and KD for offloading a few. The Rajahamsa left on time without Cuba and Hemanth, who boarded it running haphazardly at the exit of the terminal. We filled up the last 1/4th of the bus. As usual soft targets were in the firing range with KD, Hemanth, Cuba and myself taking turns at the trigger. Benjamin was busy watching some soap in his ipod. We had to bring down the noise levels whn rest of the passengers looked annoyed. After a small tea break at kamat’s in Hassan, the bus took us to Ujire nonstop. At the end of the journey, I along with Cuba was sitting on the engine bonnet and bus driver was very enthusiastic in informing us about the places nearby and how adventurous he was during his childhood. The bus dropped us at Ujire by 6:30AM. After a quick breakfast and packing up lunch at a local hotel, we hired a jeep to Mundajje Narayangowda’s house. The jeep driver charged us Rs 300( a bit exorbitant but considering 10 people and lot of luggage we thought not to negotiate) for a 12-14km drive. KD and myself stood hanging outside the jeep while the rest were stuffed inside like vegetables inside a veg bun. 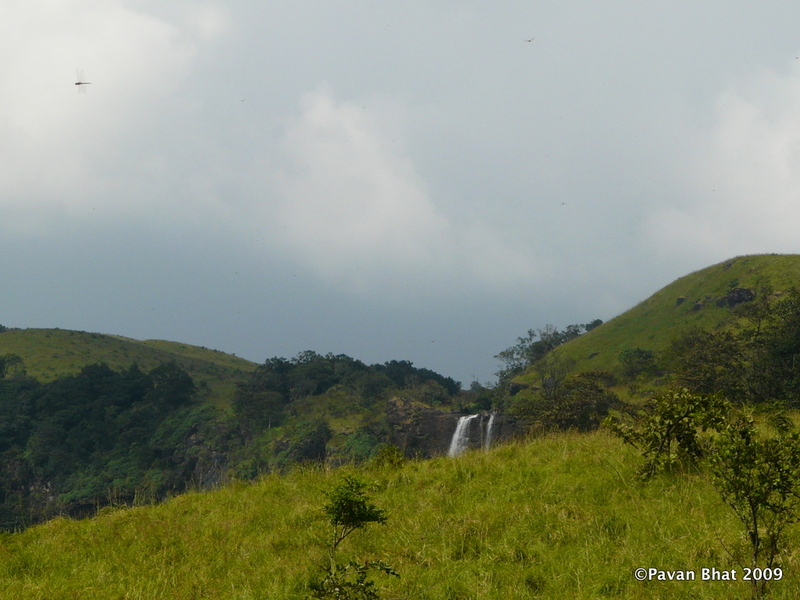 It was an awesome experience to stand outside a speeding jeep and at the end of the journey we could even spot the massive Bandajje falls at the hill top(People inside the jeep were not that lucky). Narayan gowda(NG) was standing outside his old fashioned antique looking yet majestic house( reminded me of my Granny’s house). He asked us to get refreshened and leav asap and the guide(not one, but 2! – He had called another fellow as backup!) was already waiting for us. NG’s wife came out with their grand daughter Tanvi and girls set busy playing with the baby. NG went on to explain that he is a member of zilla panchayat and has plans to come up with a trek guide with trails in the surrounding areas to promote adventure. We appreciated his effort and bid goodbye and started our trek on a trail that begins right beside his house. There is a definite trail for a few kms(until the stream) and it passes through the elephant trench(made to prevent elephants from attacking villages) and is fully leach infested. The stream crossing without dipping our backpack/shoes/sleeping bags was a little tricky and most of us managed to do it. After a short break, we entered the jungle where there was absolutely no route and the guide’s knowledge of the area was all we had to trace the correct route. The climb was quite steep and after about 3 hours of uphill and missing the route once or twice we managed to reach the exit point of forest. It was 1:30PM by then and we decided to have lunch before hitting the sunny grasslands. 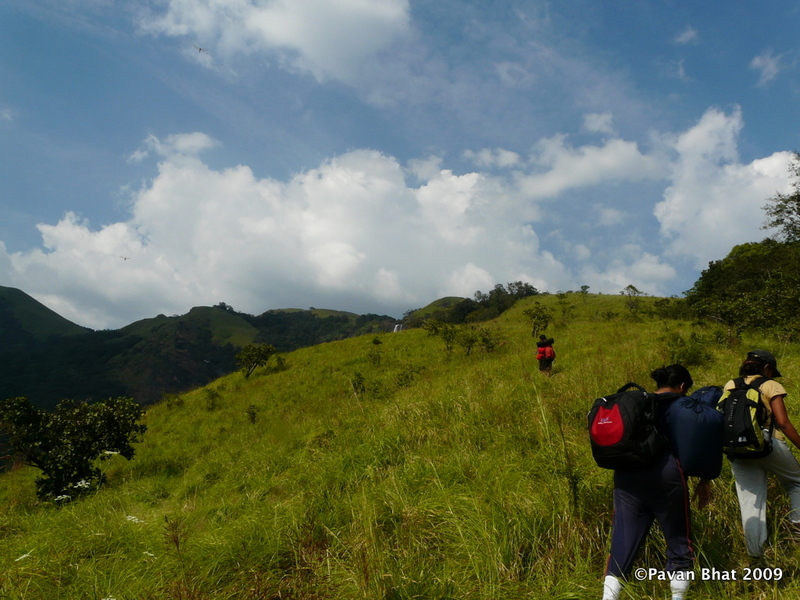 Benjamin , Sangram and Poonam had gone well ahead of us and we started very late after lunch.The uphill trek continues even in the grasslands and one can see the head of the Bandajje waterfall after about an hour of trek. We found some shade under a tree and rested for an hour or so( No water). The discussions and topics in that one hour was one of the most fun filled times in my trek life!! (@Srushti, Bindu, KD, Saritha, Cuba and Hemanth: I’m too much tempted to write! but, i’ll hold on 😉 ) Its only when someone stopped laughing – after a good one hour or so, that we realized we are far behind an d the guide was waiting for us a KM away under the hot Sun. Bandajje falls - Breadthtaking top view! The next 2 hours was a steep, never ending uphill climb on the grasslands. The surroundings looked hazy because of the heat. 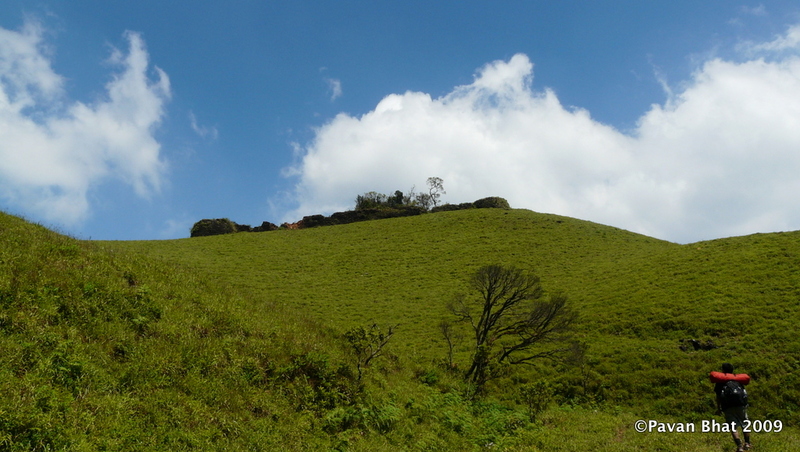 On reaching the top, we could see the head of the waterfall faintly visible behind the tree line. We climbed down the slippery path to reach the head of the Bandajje falls. In no time we dumped our bags and ran with our cameras to capture the bewildering drop of the waterfall and stunning sunset. It takes more than courage to bow down and look at the chasm from the cliff. Back at the campsite just beside the watercourse, Benji was busy fetching firewood and preparing tea while the rest of us started pitching tents. It was fast getting dark and the gushing winds repeatedly blew away the pitched tents. Later we had to dump bags stones inside to keep it at one place. Benjamin was more than happy to boil water for the ready to eat cuppa-mania dinner and prepare tomato soup to everyone. The spicy khatta meeta topping added the flavor to the dinner. The after dinner discussions was filled with PJs and anecdotes. It was a full moon night and the wilderness of the forest was getting creepier when the topic turned to ghost stories. Girls escaped one by one to the tent and hid inside their sleeping bags(out of fear? 😉 ). I had a good night’s sleep but somebody claimed they heard elephants nearby (later villagers confirmed it). The fort is a ruin. There is nothing inside apart from a compound. It looks like a small wall of china :-). There is a watch tower which gives 360 degree view of the surroundings. 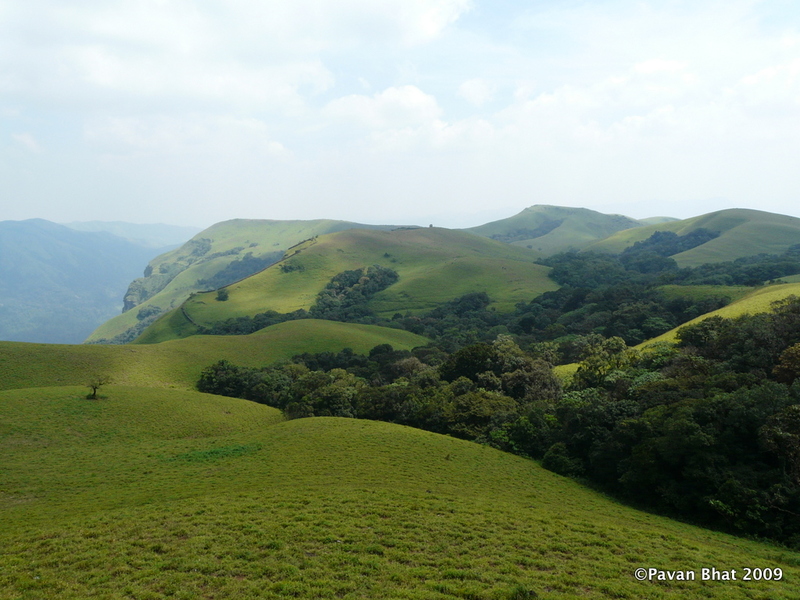 The place offers breathtaking view of western ghats and the green carpeted mountains are just mind boggling! 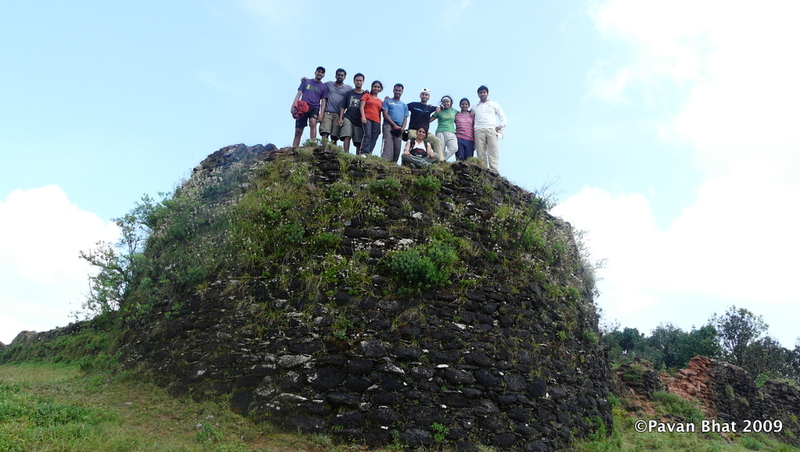 We rested for a while inside the fort and had our lunch by the time rest of the people dropped in. By 2PM we started downhill which seemed to be a easy route. After about 2 hours of trek we reached a temple at the base of the hill and rested there for a while before hitting the jeep track. It is about 8Kms to Sunkasaale from this place and we availed auto service available for the last 5kms. On reaching Sunkasaale we bid goodbye to our guides (paid them Rs.700, 300 per day and Rs.100 for traveling back). By the time we had tea at a local shop, A bus to Horanadu stopped at the bus stop and we got in. There is a bus every half an hour from 5PM to 6:30 PM to Horanadu, the autowala said. 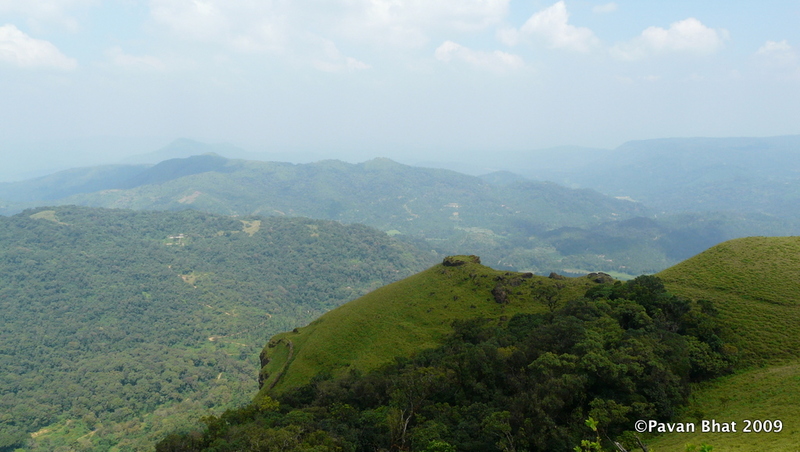 Horanadu is about 30kms from Sunkasaale and the bus passes through Kalasa. The bus dropped us in Bangalore Majestic bus terminal by 6:30 and we all parted promising to meetup on a dinner someday the same week. And, we DID. Had a rocking time, AGAIN! 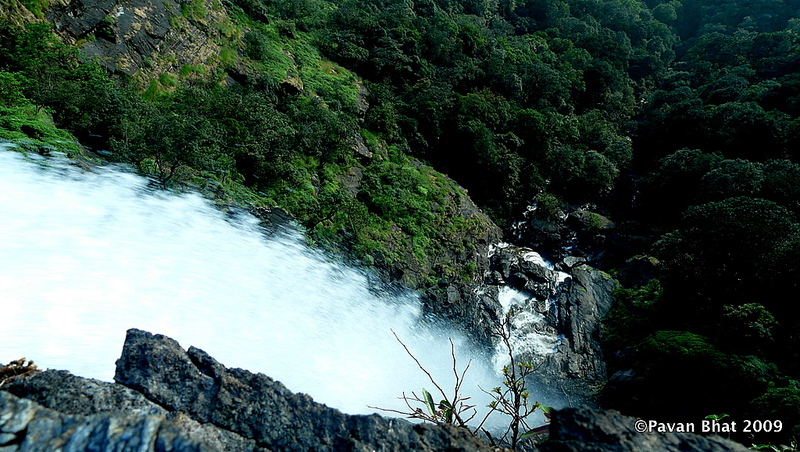 * There are two possible routes: Mudajje – Bandajje falls – Ballarayandurga fort – Sunkasaale in that order OR in reverse order. I do not suggest reverse order as it takes out the fun and beauty of the route. *Jeeps are available from Ujire to Narayangowda’s house. Call him up well in advance and know the weather conditions, rainfall and guide availability. *camp just beside the Bandajje falls. There is a small campsite where one can pitch 3 tents. *On the 2nd day, Leave the campsite as early as possible. 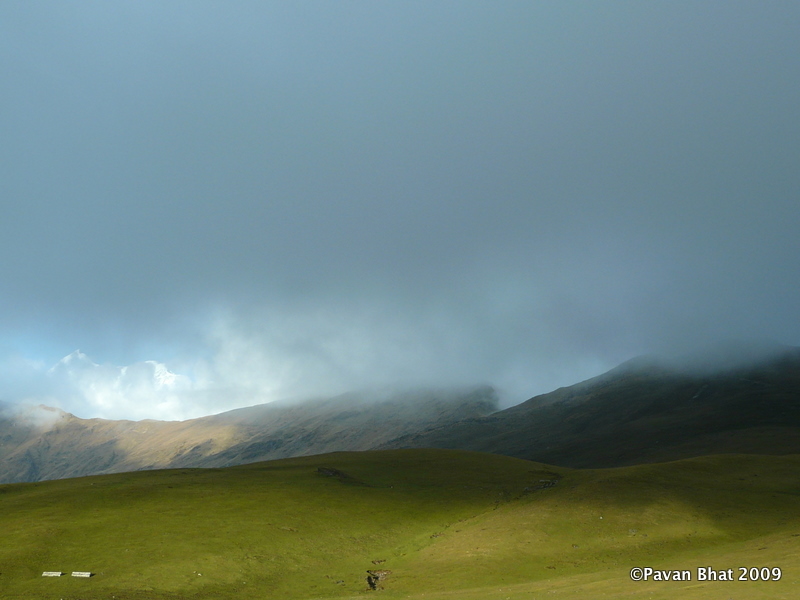 One can enjoy the mist filled meadows on the way to fort. It gets really hot later. *carry enough water. 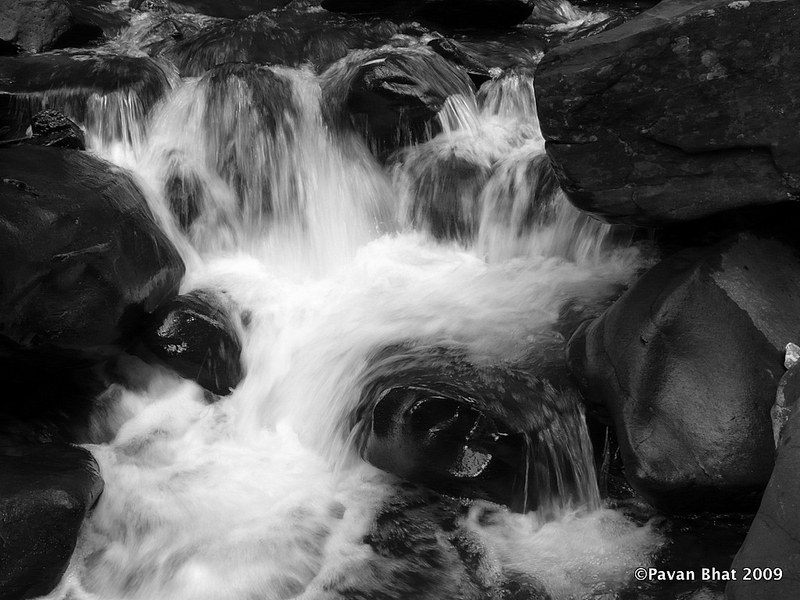 Only water resource – Bandajje waterfalls. It was silent. I could hear birds chirping. No fan and no alarm but still I woke up at 6. It was cold. I recollect today’s task ahead: Didna=>Tolpani=> Khopal top => Ali bugiyal => Bedni bugiyal, a 12km route. I come out of the tent and go straight to the bonfire which was still hot. I sit there for a while before getting back to tent and packing my bag. Soon after that, we had a quick breakfast(bread-jam / omlet) and Rajesh promised that Alu paratha will be waiting at Ali bugiyal for us. Our plan was to reach Ali Bugiyal by 11AM and rest there for half an hour before proceeding to Bedini. 2 batches left ahead of us. Our Bangalore gang was a bit late to start and confident that we’ll catch up, we started climbing slowly. Soon after crossing a stream behind Didna, starts a rather easy forest walk for about an hour or so until we reach Tolpani. Tolpani is small 4-5 house village,2 kms from Didna. Raghu wasn’t feeling all that well and was walking on paracetamol. He was very paranoid of being hit by AMS. 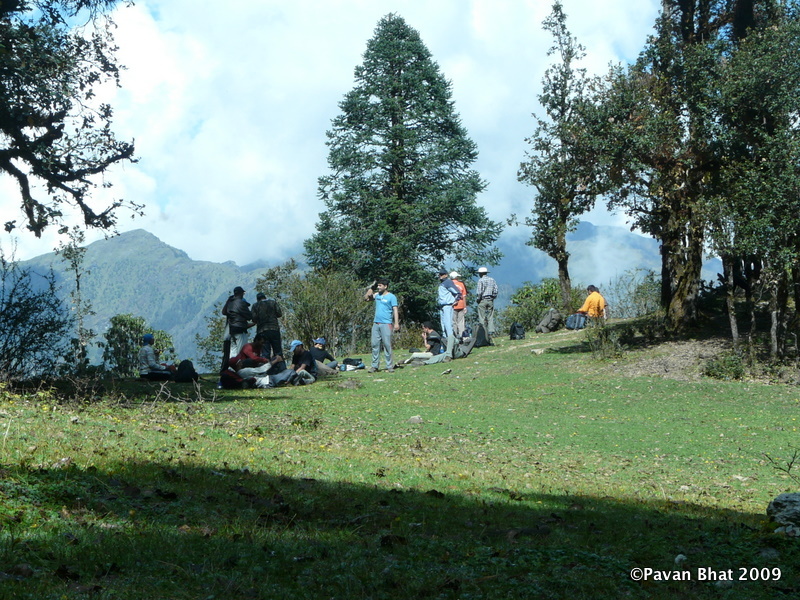 We stopped at the water source of the village and waited for rest of the team. The green fields were shining bright with the morning Sun. The villagers were reluctant to pose for the camera and seemed busy with their daily work. Then starts almost vertical but zig-zag climb that passes through the thick jungle. I was happy to run overtaking the rest of the people and joined Narayan ji who was leading the team. We stopped at Khopal top (people also call it Tol top) for about half an hour, before most of the team joined us. One can see the majestic Choukamba(7838mts) from a point at Kopal top. I was hungry and there was just one thing ringing in my mind, to run to Ali Bugiyal as soon as possible and eat Alu Paratha! After pestering our guide for a while, he dropped the idea of waiting for the entire team to arrive and left with us telling the rest that there is a definite trail to follow. Entry to the world of Lawn! 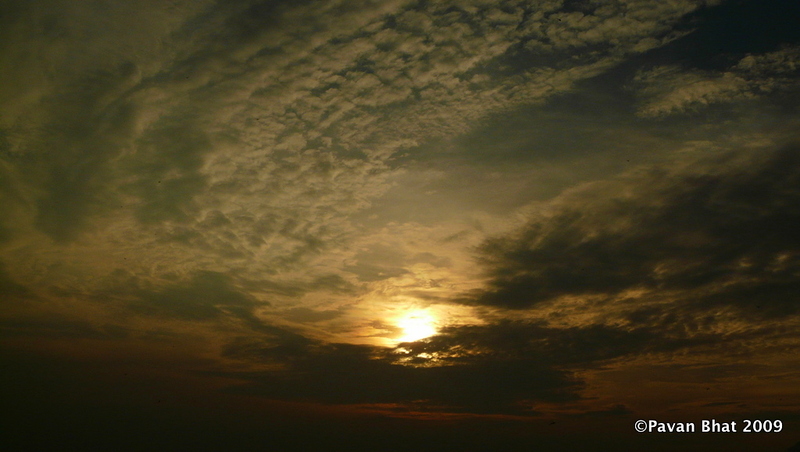 Clouds- the artist. I just missed the India map formation! Alu paratha at the most beautiful resturant! It was half an hour climb form Khopal top, I was taken by surprise when all of a sudden a different world opened up. It was no more jungle, no more brown. 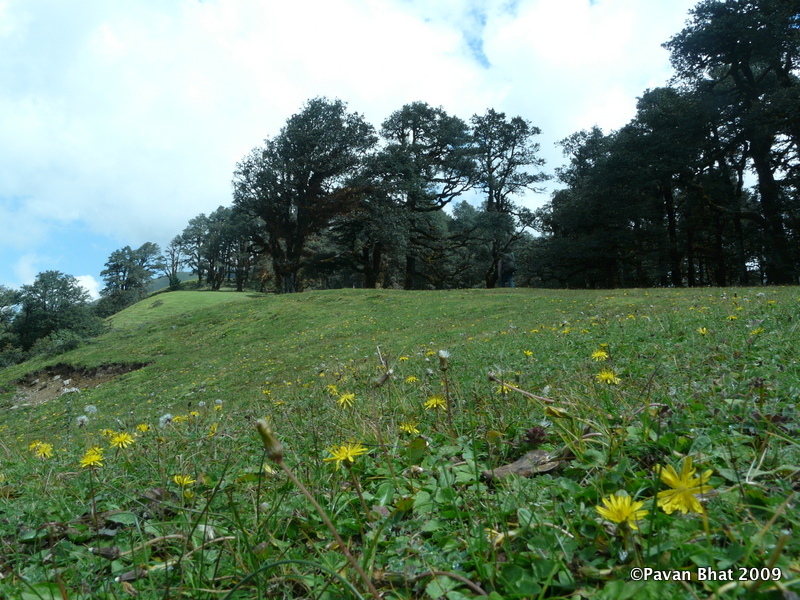 It was green lawn spread over kilometers of soft humped mountains decorated with yellow flowers. There were beautiful trees rooted to please even the daemon to get his girlfriend to play hide and seek:-). There were clouds hovering right through the place in all directions creating mystic figures. It was cold as I walked through the mist and then there was Sun to pinch and tell boy, you are not dreaming. From there I could see the entire first day’s route. I could see Lohajang, Wan and Kulling. Ten minutes – All over. 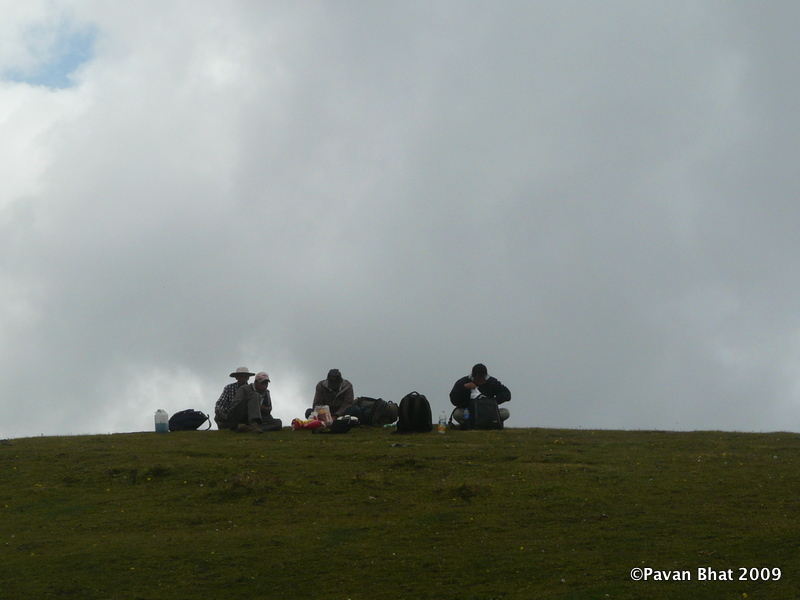 (only Me, Ambreesh, Kunal, Neelima and few were lucky)By the time rest of the team arrived, there was a complete cloud cover. All the views were gone. Now, i realized something – damn, i’m hungry. I want Alu paratha! I started running shouting to Narayanji “I want to reach Alu bugiyal! ” I was so occupied that I had renamed Ali bugiyal!. On the way I saw a few langoors in the forest to my right. The meadows looked never ending until I saw Gopal waving at us. I ran with KunalAmbreesh, straight to him telling “I want 10 paratahs fast!” He said calmly “sab ke liye sirf ek ek milega, baaki Bedni mein milega”. I felt bad but said to myself ‘Paalige bandid Panchaamrutha’ and ate that Paratha in one go. Flattered with the actual or reflection?! Then I saw around. 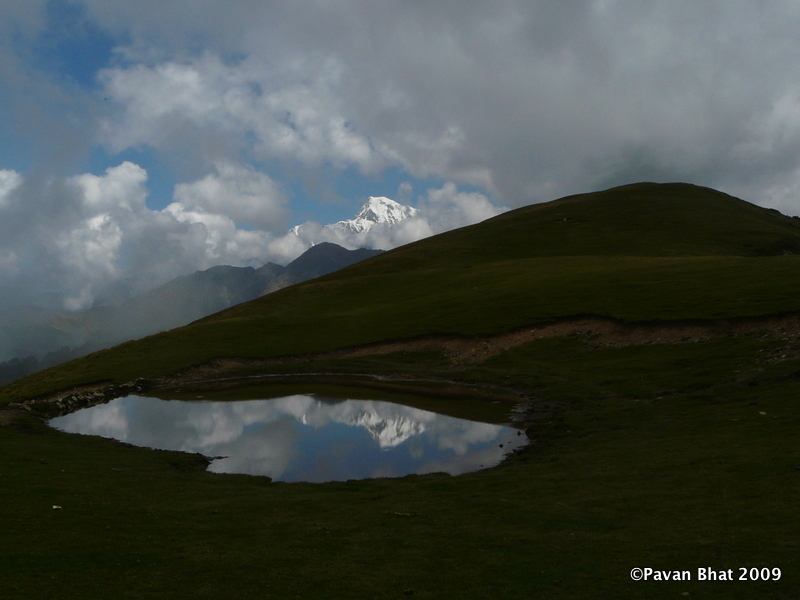 There was a small pond (kund). It had a name but I don’t remember. It was green all over me and it looked like an expensive, well maintained lawn. There was Nanda gunti peeping with all its grandeur(as usual). I went to the other side of the pond where I could see Nanda gunti’s reflection in it. It just gave me 2 minutes to click a pic before the clouds covered the complete area. By that time most of the team had arrived. A few of us decided to continue and not wait for the rest of the team. 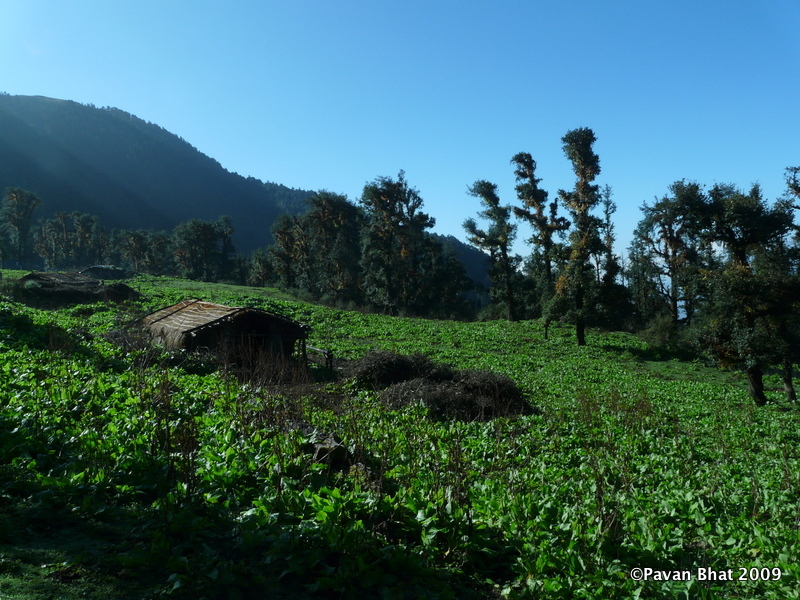 The next 1 hour was memorable walking in the lush green and cold meadows. 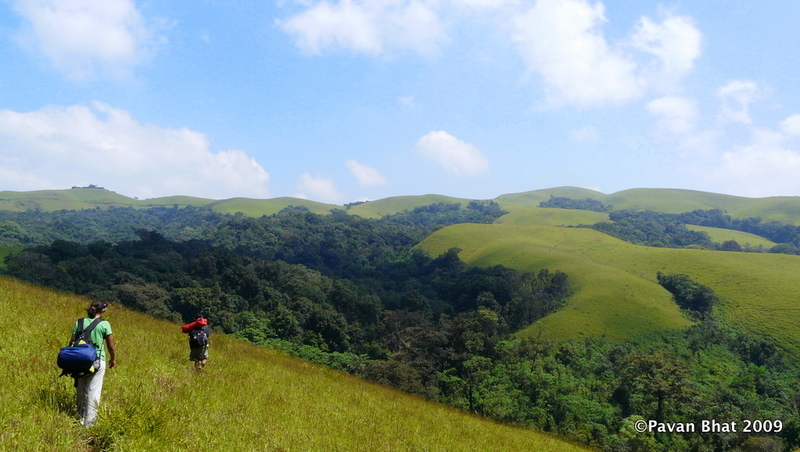 I had seen a minor version of it near Kemmanugundi(karnataka) but this was tens of kilometers of green carpet. 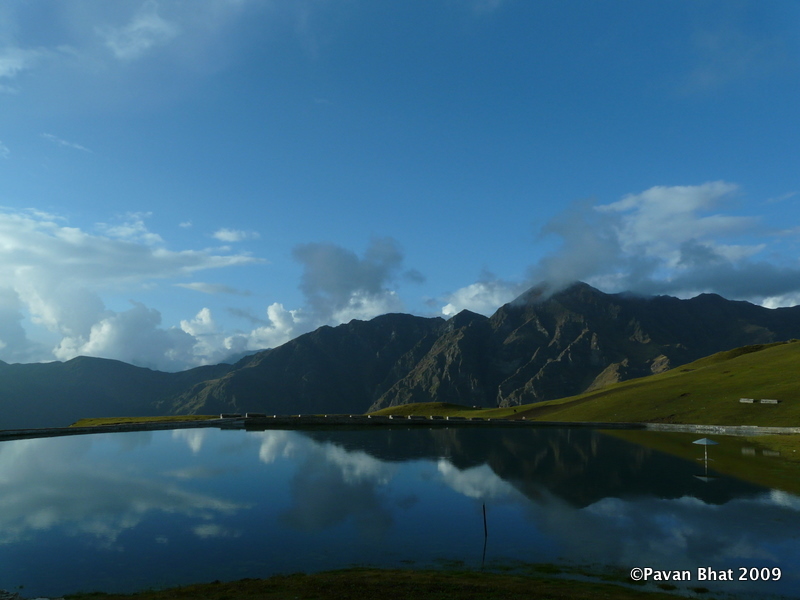 Branded as one of the most beautiful meadows in Asia, it can defeat any other competitor hands down. 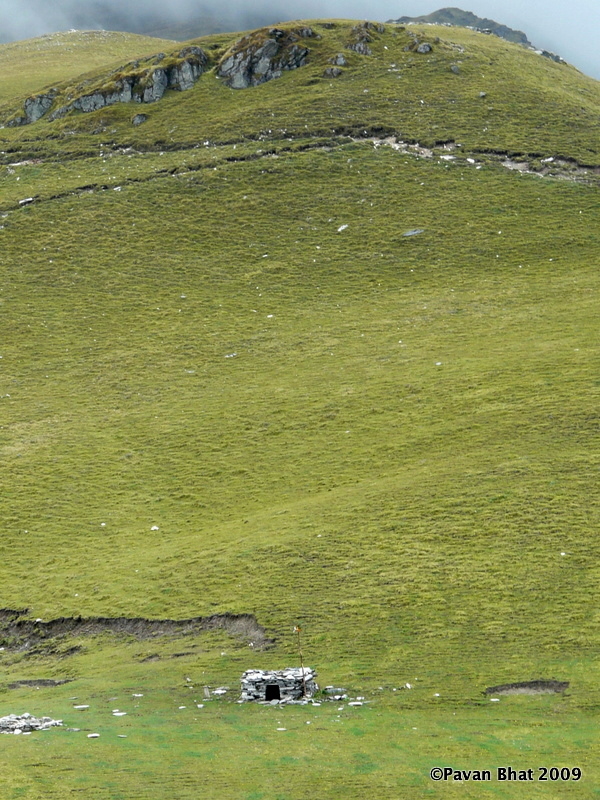 We reached a small temple which was in the middle of nowhere( It appeared to separate the bugiyals – Ali and Bedini). There we saw the famous “Bedini vultures”. Previously Rajesh had told us about these creatures. 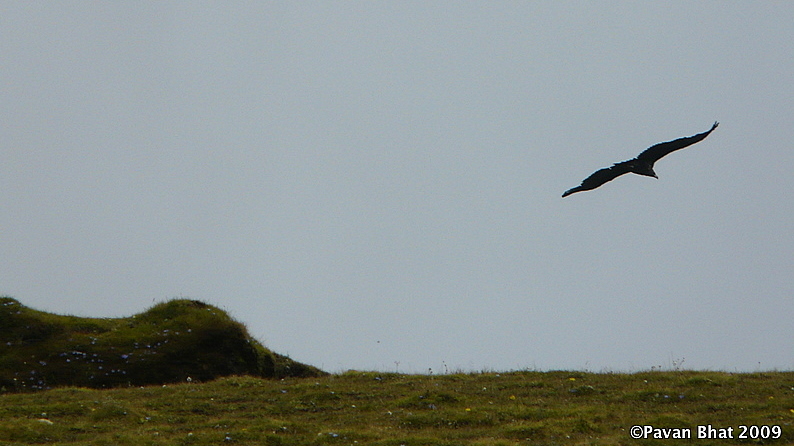 These are huge scavengers whose wingspan are in the range of 1-2 meters! They don’t usually trouble anyone, Narayanji say. 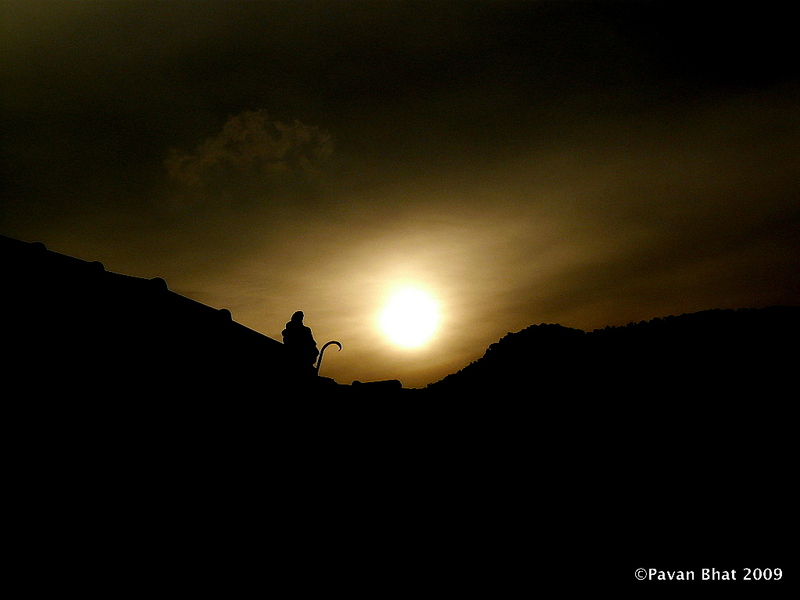 From the temple, its 15 minutes climb and then easy walk for about an hour to reach Bedini. 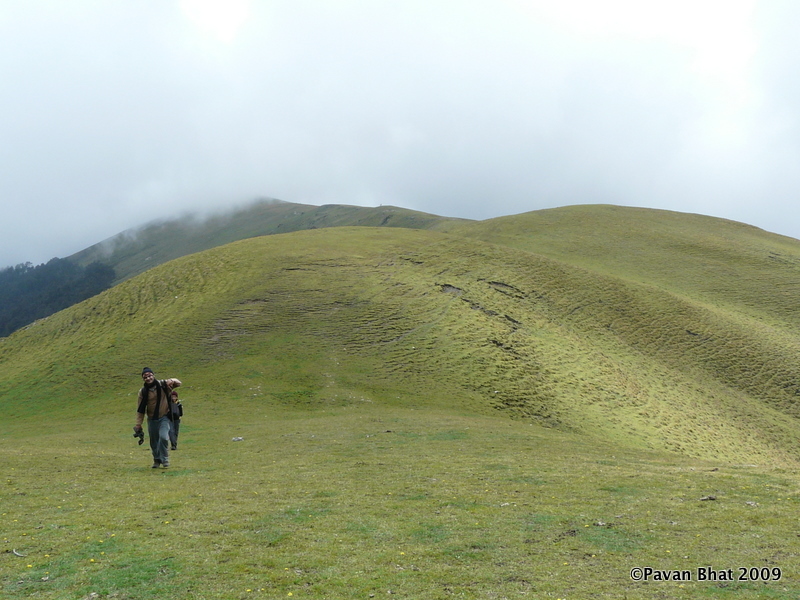 On the way we met two Isreli travellers who had come to just visit these bugiyals(Not Roopkund!) and they were praising its beauty. As soon we could see the campsite, I ran to it and booked the best placed tent and ran straight to Kitchen tent asking “where is the paratha? ” to which Gopal said “khaana abhi bhi ban raha hai, soup ready hai” to which I say “Anything, just give”. Then? I sit watching the vultures fly and have 5/6/7(I don’t remember) glasses of soup by the time rest of the team arrives. Then it started raining heavily and I wait inside the tent waiting for food. It got real cold and I slept off. It rained for about an hour and once it stopped I came out for lunch. 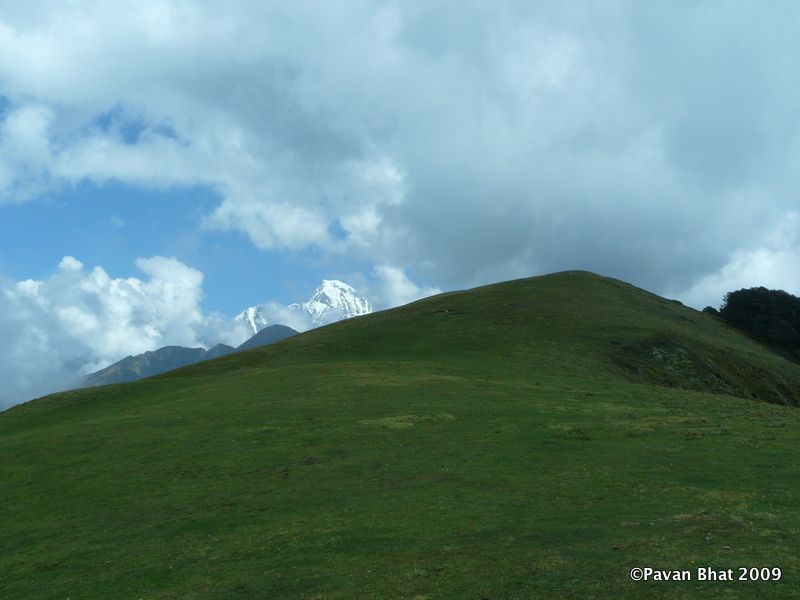 The area was completely cloud covered and when it opened up in the evening, we saw partailly cloud covered Trishul(7120mts) to the south of Bedini, beside Nandagunti. 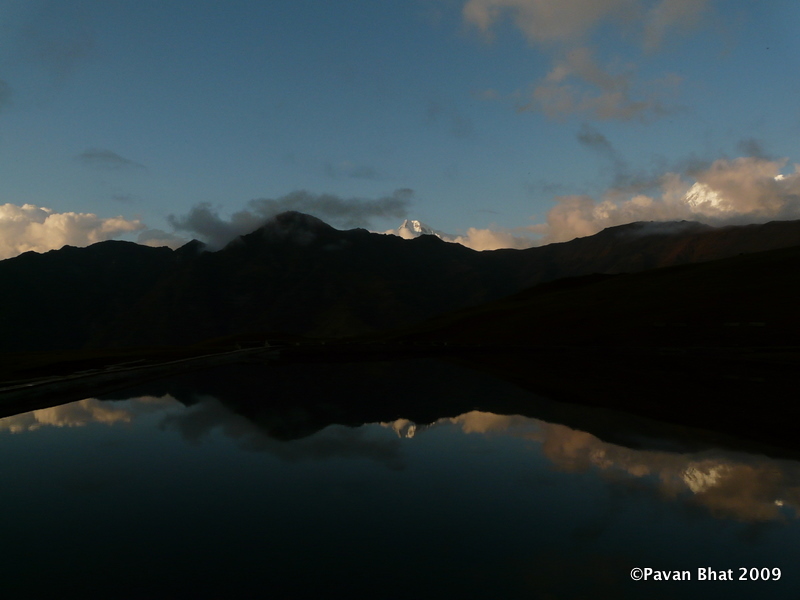 I walked up to the Bedini kund with Deepak, Poonam and Neelima to get the reflection shots of the mighty mountain in the kund. Deepak was so pleased with the view that he summoned for Smita. The Trishul was very stubborn to open up completely. But we still got amazing views. As it got dark, it got colder and colder and there was no firewood available for bonfire (its a grassland). So Ravi, Ambreesh, kunal and me settle down in the tent playing cards(for a long time) until we were called for dinner. Soon after dinner I slid to sleep in my tent shared with Deepak and Rajesh.